3 girls and 3 boys, all tri except one girl. This litter was born in Hillsborough, NJ, at the farm where Vesta is currently working. I'm keeping a pup, 3 are already on to their new homes, and 2 others will stay here till fall then fly to their new home. They are all friendly, curious, and comfortable in their world. 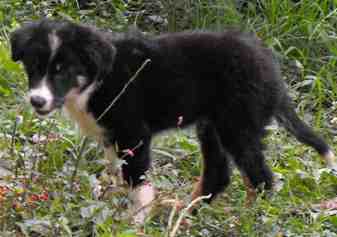 Cass is staying here at North Face Farm to be a sheepdog. She knows what she wants and does not hesitate to get it. She is quite the Machiavellian little creature. Nessie stayed at Jersey West Farm where her mother Vesta works. She will be a sheepdog. Ani and her littermate Saul went to Brazil to be a working stockdogs. She is quite a sweetie, very people focused. Ani and Saul stayed here an extra month before they were old enough for the trip and in that time they both decided that they wanted to work. Saul traveled with Ani above. I really like this boy. Maybe it is just the smooth. He's a strong boy and quite the curious explorer. Saul was here an extra month waiting to fly to his new home. He showed a strong desire to work before he left, not even 3 months. 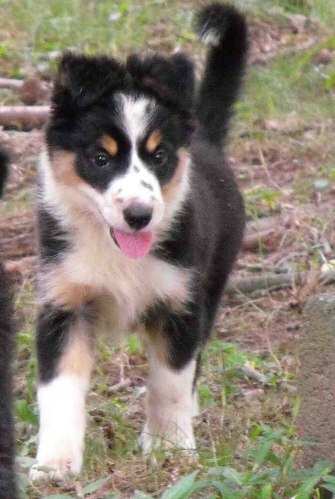 Taff has gone to be a sheepdog and agility dog. He is a persistent little guy about getting to the side of the door/gate he wants to be on. I had put the pups away in what I thought was a puppy safe pen while I worked the older dogs. Next thing I knew little Taff was at my feet in the pasture. He repeated this a couple times before the others (or I) figured out how he was escaping. Caesar has gone to his new family to be a companion and agility dog.